India has for the first time seen the birth of a chicken with polymelia, according to a recent report. 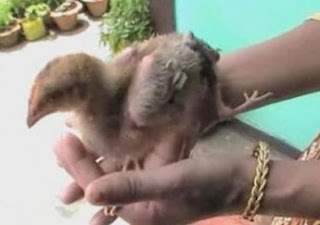 Chicks are generally seen with two limbs, this one has arrived with an extra set but. The rare birth was seen five months back in the Northeast village of Kitam. And the same is not something good, but is rather a defect that, according to experts is curable with a surgery. It has been told that the genetic deformity takes place while developmental process of embryo is on. It is even being said that other animals can get this defect as well. “If it a major vital organ, it needs a major surgery otherwise limps and all we can take out with minor surgery and they can survive for their normal life”, affirmed Arjun Adhikari, local veterinary expert. However, the chicken is living almost a normal life, its two extra legs appearing suspending from behind but need to be corrected. Since, no particular reason is there behind the realization of deformity and worshipping such an animal or just taking its life would not be anything new if seen happening in India. It is now to be seen if a surgery is carried out on the chick or some other picture comes the way.